Our series of HDMI converters, switchers, extenders, matrixes and splitters are designed to make your A/V device use more convenient, more comfortable, more productive and more cost-efficient. The 3x1 HDMI Switcher allows a single HDMI sink to access multiple sources. 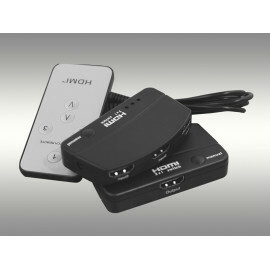 The Switcher allows three HDMI devices to be switched easily through one HDMI compatible monitor or projector. The Switcher can also be placed at the end of a long HDMI cable to regenerate the HDMI signal. Inputs can be switched by button.